Documenting processes is a requirement for most organizations. The approach they take is invariably, well varied and often different. How all of them fall into one of three categories. Each one has some benefits and some downsides. Let’s start with the narrative approach. 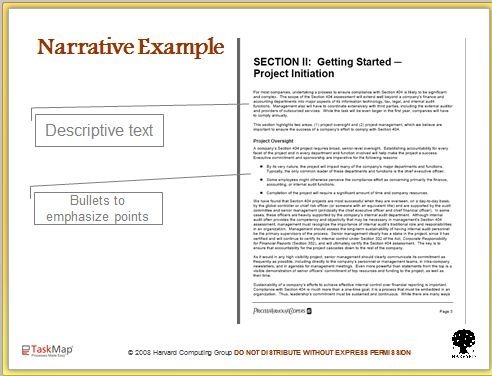 A narrative approach has the following attributes; Usually linear in nature, describing the processes as it unfolds in words, frequently using MS Word or Excel as the tools of choice. The benefits here are pretty well everyone can read, and most of us have these basic products on our desktop. So it’s a lowest common denominator to create process documentation. In order to highlight our points and make it easier to pick out key instructions, bullets, tables and numbered lists are often used. As shown by the picture below. 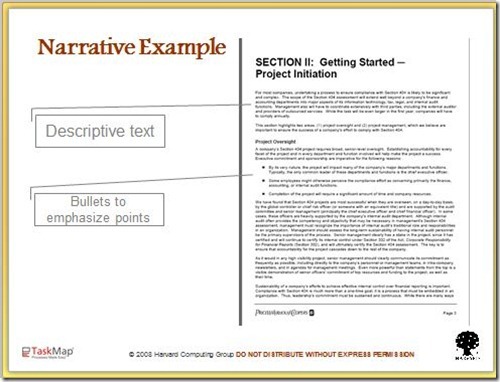 Narrative example from Fundamentals of Process Mapping courtesy Harvard Computing Group, Inc. However, narrative will only get us so far documenting processes, exception paths, multiple decisions and outcomes all cause problems to represent the results.